Barrel, also known as Barrel Game, is a minigame hosted by Bink in Mario & Luigi: Superstar Saga and Mario & Luigi: Superstar Saga + Bowser's Minions. In the S.S. Chuckola, Mario and Luigi had to retrieve one of the pieces of the Beanstar that made its way into the ship. They notice a sailor taking the Beanstar piece into another room. However, a guard permits no entry unless the brothers can get a Membership Card, explaining the cellar is too important as it contain all of the ship's Chuckola Cola. In another room, a skeleton named Bink offers them a job of pushing barrels, as a minigame. The minigame has a field of red and blue barrels in a 6x6 grid. The objective is to slide the barrels so that an entire row or column is only one color, with the time limit of three minutes. The player uses and on to move Mario, and and to move Luigi. 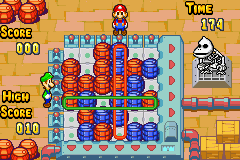 To slide the barrels, while holding , the player pushes and to move Mario's columns, and and to move Luigi's rows. When an entire line is cleared, the brothers earn one point, and can earn more points for each additional line cleared, with four points for two lines, and eight points for three lines, and even sixteen for four lines. As lines are cleared, Bink will throw in more barrels into the field for Mario and Luigi to work with. As the Bros. clear more lines, yellow barrels will be on the field along with the blue and red ones, and even green barrels should they clear even more lines. Upon completion of the minigame with ten points or more, Bink gives the Mario Bros. a Membership Card, and the Bros. go back to the guard, who lets them pass. The player can play this game as much as they like before the S.S. Chuckola sets sail and becomes permanently inaccessible. It becomes available again in the Little Fungitown arcade, however, and can be played to earn Hee Beans. The Mario Bros. receive one point for every line matched, four points for a combo of two lines matched at once, eight points for a combo of three lines matched at once and sixteen points for a combo of four lines matched at once. If the Mario Bros. score three lines at the same time, a small skeletal Chain Chomp will peek out from behind the crates on the bottom-right corner of the screen. If the Mario Bros. score four lines at the same time, a small skeletal man resembling a Stalfos from The Legend of Zelda for the NES will peek out from behind the crates on the bottom-right corner of the screen. The music used for this minigame is a cover of the overworld theme from Super Mario World. In Mario & Luigi: Superstar Saga + Bowser's Minions, the music is a remix of the mini-game theme from Mario & Luigi: Dream Team. ↑ Stratton, Stephen, and Levi Buchanan. Mario & Luigi: Superstar Saga Prima Official Strategy Guide. Page 23. This page was last edited on December 30, 2018, at 22:33.